Carl Ostermann wins French SX Championship in Saint-Valéry-en-Caux! The weekend could not have been better. 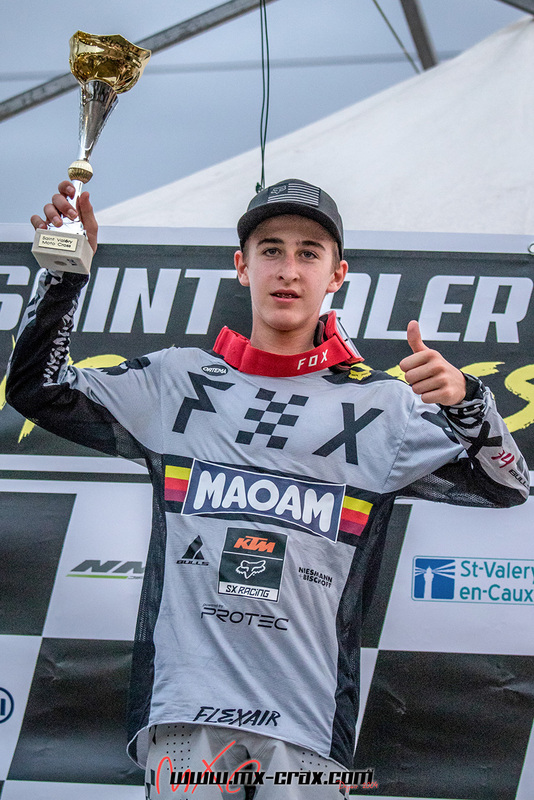 In the third round of the French SX Championship in Saint-Valéry-en-Caux, FOX-youngster Carl Ostermann won both heats and took home a well-earned win as champion of the day. However, it was a hard road to victory. The speedy leading group was neck and neck, and in the second race, after a holeshot, the 13-year-old from Bonn had to defend his position from the attack from Maxime Grau and Baptiste Bordes right up to the final seconds of the race. This of course was very much to the liking of a crowd that saw a supercross performance at the highest level on the fast track in Saint-Valéry-en-Caux. It all finally came together! I was ahead in the starts and managed to maintain my top speed over the whole distance. I also had permanent pressure and therefore no time to think too much. And I am also back in the challenge for the French SX Championship! The break between round 2 and 3 of the French SX Championship helped us to refocus and work on the outdoor SX speed. Carl made a big step forward. He was focused all weekend and put everything together from practice to race. Hard work paid off and put Carl back in the Championship hunt.